There are as many modified electric guitars in the world as there are guitarists who play them, but rare is the modified â€œoff-the-shelfâ€ guitar that is elevated to iconic status by the artist who played it. Such is the case with Jeff Beckâ€™s â€œOxbloodâ€ Les Paul, a guitar from the heart of tone history. Gibson has unveiled an accurate recreation of this legendary instrument: the Jeff Beck 1954 Les Paul Oxblood. The guitar joins a range of signature Les Paul guitars from the likes of Jimmy Page, Slash and soon, Michael Bloomfield. Beck made a big name for himself right from the start, stepping into very big shoes in The Yardbirds as Eric Claptonâ€™s replacement, then splitting off to form The Jeff Beck Group with Ron Wood and Rod Steward in 1967, all before the age of 25. Come the â€™70s, though, Beck was forging his reputation as a solo artist â€” and one of the hottest guitarists of his generation â€” and he was doing it on a Gibson Les Paul. And like so many legendary guitars, the Les Paul in question made its way into its artistâ€™s hands not through an endorsement deal, or a gift from the manufacturer, but through the lucky happenstance of some down-time being killed with a little browsing at a local music shop. While recording in Memphis, Beck paid a visit to a popular music store called Strings and Things to check out the stock. The guitar that caught his attention was a â€™54 Gibson Les Paul that a customer had dropped in for some very specific modifications. One request was that its original Goldtop finish be stripped off in favor of a deep chocolate-brown finish, a color that turned out to exhibit some oxblood tints in certain light. Other modifications included the installation of full-size humbucking pickups in place of the P-90s, altering the full and rounded early â€™50s neck shape to a slightly thinner profile and changing the original tuners for modern replacements. 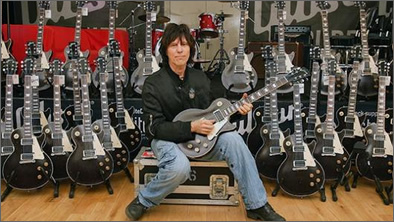 Legend has it that the customer didnâ€™t like the results â€¦ but Jeff Beck did. He purchased the modified Les Paul from the store, and ended up playing it extensively on tour and in the studio. He even gave it pride of place on the cover shot of his milestone 1975 album, Blow By Blow. A tone legend was born. The 1954 Jeff Beck Les Paul Oxblood is the most detail-precise reissue of this hallowed instrument ever produced by Gibson Custom. All of the intensively accurate Custom Shop craftsmanship is there. From the one-piece light mahogany back to the accurately-arched carved maple top to the light aluminum wrapover bridge to the one-piece Beck-profile mahogany neck with long-tenon neck joint. Beyond even these, however, the instrument exudes the vibe of the original, with a feel, sound and finish match that pay homage to Beckâ€™s own modified Les Paul. Even the pickups, Gibsonâ€™s Burstbucker 2 and Burstbucker 3 (neck and bridge respectively) are among the most accurate vintage PAF reproductions that Gibson has ever conceived, right down to the irregular windings from coil to coil and their lack of potting, two ingredients that contribute to an authentic late-â€™50s and early â€™60s humbucker tone. This guitar spoke to Jeff Beck throughout the â€™70s, and it defined his throaty, emotive tone and encouraged his extreme use of sustain and harmonic feedback, all along the way helping to define the cornerstone sound of the Gibson Les Paul in the hands of a superlative artist. Available in very limited numbers, the Jeff Beck 1954 Les Paul Oxblood from Gibson Custom will come in two different series. The first 50 of these historic guitars will be carefully aged by the master luthiers at Gibson Custom to look exactly like Beckâ€™s original, then personally hand-signed, numbered and played by Beck himself. The next 100 guitars will be prepared with Gibson Customâ€™s pioneering V.O.S. finish, bringing the total run to just 150 rare instruments. Each one also comes with a specially produced Gibson Custom case with Beckâ€™s signature silkscreened on the top, a custom care kit and a certificate of authenticity.